I had the pleasure of attending the Stampin' Up! regional in San Antonio this past weekend. One of the great things about attending a Stampin' Up! event are the neat projects you get to make while you are there. We made this cute little note card set which features the Scallop Notes that are found on page 167 of the current Stampin' Up! catalog. I think a lot of times these great time saving note cards are overlooked in the catalog. I know I was a demonstr ator for two years before I discovered there was more on that page than envelopes! 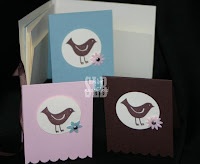 I'm showing you the outside cover of the note card holder as well as the three little cards we made. I didn't stamp any verse on the note cards as I wanted to reserve that for when they are needed! All products from Stampin' Up! I'm just about finished with my projects for my upcoming Christmas Giftables Class. I'll be posting those pictures tomorrow and sending out a newsletter with sign up information for that class as well as my calendar class. If you are on my newsletter list, watch your email for information!